Nestled alongside the flashier new features in iOS 5 is a smaller, subtler addition—deep integration with the Twitter microblogging service. Twitter has always teamed up nicely with Apple’s iOS devices, as evidenced by the array of third-party Twitter clients available via the App Store. With iOS 5, the ties run even deeper, as you can now tweet photos, links, and more from wherever you happen to be at the time. Evidence of the Twitter integration can be found the moment you launch the Settings app. You’ll notice a new Twitter option sits snugly between FaceTime and Mail, Contacts, Calendars. From that Twitter pane, you can add one or more Twitter accounts. For each account, you can set whether you’d like your location included by default when you tweet. There’s also a button to install the free official Twitter app, if you don’t already have it installed. You configure your Twitter account (or accounts) in a new section of the Settings app. Once you’ve successfully set up at least one Twitter account, you can send tweets from a variety of built-in apps: Safari, Phone, Contacts, Photos, Camera, Maps, and YouTube. The Twitter settings screen offers two other options as well. When you tap Update Contacts, any contacts in your address book that Twitter can identify (by email address) will get updated with their Twitter username and photo. You can also control—on an app-by-app basis—which apps can use your Twitter credentials. Only those apps that get updated to leverage iOS 5’s built-in Twitter integration will be listed. They show up only after you first use a Twitter action in them—that is, apps will get listed in the settings screen only once you’ve sent a tweet from within them. 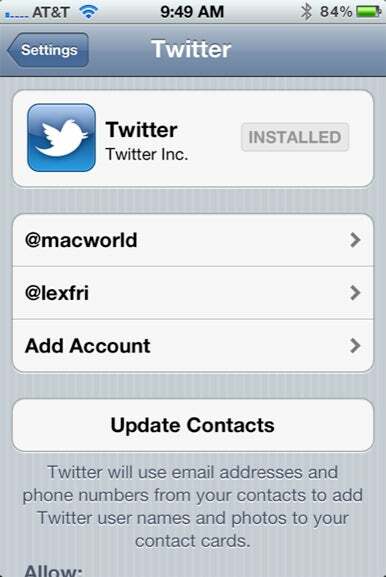 Before iOS 5, Twitter clients like Twitterrific could only log you in to your Twitter account by first presenting you with a Twitter Web form, which made setting up multiple accounts especially annoying. Now—once updated—such apps will be able to access your Twitter credentials directly. In time, that should also make it easier to tweet from within other apps, like games (say, for when you achieve a high score) and camera apps (for when you create content elsewhere that’s worth sharing). The tweeting experience for apps that leverage iOS 5’s integration remains consistent between apps. In apps that offer the Tweet button, you can bring up the so-called Tweet Sheet, which, unsurprisingly, sits ready for you to compose your tweet. The Tweet Sheet looks the same regardless of which integrated app you’re tweeting from; it employs a design of Apple’s own and doesn’t match the official Twitter app’s look and feel. If you’ve configured more than one Twitter account, you can switch between accounts. There’s a character countdown widget showing how many of your precious 140 characters you have left. You can tap to add your current location to your tweet. And any attachment—either a link, or one or more images—is displayed in thumbnail form, attached to your tweet with a virtual paper clip. When your tweet posts successfully, you’ll hear a bird chirp of confirmation. You can disable the chirp by navigating to Settings -> Sounds -> Tweet. When you tap to tweet from any apps that support Apple’s Twitter integration, you’ll see the Tweet Sheet for composing your post. iOS 5’s built-in Twitter integration certainly makes it easier to tweet specific kinds of content, like links and photos, quickly—but there are some limitations. 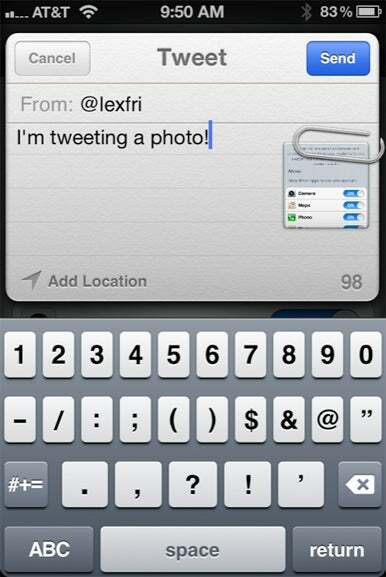 In the Photos and Camera apps, you can tweet only a single photo at a time. And there’s currently no explicit option to compose a tweet without any attachments at all—but you can still pull it off if you’re so inclined. When you look at any contact whose address book entry includes a Twitter username, you can tap on that username to expose two Twitter options: Tweet and View Tweets. Tapping the former brings up the Tweet Sheet so that you can compose a new message, with that contact’s username prepopulated—as a traditional Twitter public mention (not a direct message). If you want to write a brand-new tweet, you could always delete your friend’s username and start your post from scratch. The View Tweets option is meant to let you view the given user’s tweets in the official Twitter app.